The key to losing weight is to eat fewer calories than you use throughout the day. This creates a calorie deficit, causing your body to burn stored fat, leading to weight loss. Giving up meat -- either temporarily or as a change to a semi-vegetarian lifestyle -- is one way to cut calories. Substituting vegetarian alternatives for red and processed meats can lower the fat and calories in your meals and help you shed pounds. Protein is important for weight loss, as it helps people to feel full and satisfied after eating. A review published in The American Journal of Clinical Nutrition in 2015 noted that the potential for increased weight loss due to decreased appetite is most likely if you get at least 25 grams of protein in each meal. Meat is one of the main sources of protein for many Americans, but there are lots of other, potentially lower calorie options for meeting your protein needs. Meat is a significant source of calories in the diet, which is why cutting back can be helpful. For example, a 3-ounce serving of pork ranges from 120 calories for roasted tenderloin to 330 calories for braised spare rib. For a 3-ounce serving of beef, round steak has 170 calories but large end rib roast has 300 calories. Processed meats are high in fat, sodium and calories, and are not healthy for weight loss. Just one slice of bacon has about 56 calories and more than 4 grams of fat, and even though a 3-ounce serving of ham only has 151 calories, it has more than 53 percent of the daily value for sodium. Many people eat more than one serving of these meats, so switching to a non-meat protein source can potentially result in a large number of calories saved. Depending on the type of fish or poultry you choose, it can be lower in calories than red meat. Light meat chicken is better for weight loss than dark meat chicken, and baked or roasted chicken is lower in calories than fried chicken. A 3-ounce serving of roasted chicken breast has about 170 calories, but if you opt for wings instead you'll be getting 240 calories. Even the wings would save you 90 calories over spare ribs, however. In a year's time, eating roast chicken instead of spare ribs just once a month would save over 1900 calories, which equals about half a pound of body weight. Seafood is even lower in calories, with a 3-ounce serving of broiled, steamed or baked seafood ranging in calories from about 70 for broiled skinless orange roughy to about 190 for baked skinless salmon. Seafood also is a particularly nutritious substitute for red meat, especially the fattier types like salmon, as it provides the omega-3 fats that can be difficult to get in a purely vegetarian diet. If twice a month you enjoyed 3 ounces of boiled shrimp instead of your weekly Friday-night chicken wings -- a difference of 140 calories per serving -- you'd drop almost a pound over a year's time. Each hard-boiled egg has just 78 calories and provides more than 6 grams of high-quality protein. Dairy products are also good sources of protein and can be low in calories. For example, a single-serving container of nonfat plain Greek yogurt contains about 100 calories, and 1/2 cup of low-fat cottage cheese has about 92 calories. For those who are looking for vegan protein sources, a 1/2-cup serving of beans contains just 104 to 127 calories -- depending on the type of beans you choose -- and a 1/2 cup serving of firm tofu has only 88 calories. Eating tofu would help you save 32 calories compared to eating pork tenderloin, which is one of the leanest meat options, and tofu has 212 fewer calories than the fattier beef roast. Simply substituting tofu for beef roast just once a week for a year would cut over 11,000 calories and help you lose about 3 pounds. Giving up meat, poultry and seafood and going vegetarian may make it easier to lose weight. A 2015 review article in the Journal of General Internal Medicine reported people on a vegetarian diet lost more weight than those on a non-vegetarian diet. In addition, those following a vegan diet -- which excludes all animal products, including eggs, dairy and even honey -- shed more weight than people eating eggs and dairy products. Restricting calories and switching to a vegetarian diet resulted in the largest weight loss, so just giving up meat may not give satisfactory results. Making other changes besides giving up meat will make it even easier to lose weight. For example, foods lower in energy density -- or calories per gram -- take up more space but don't provide many calories, making it easier to stick within your calorie limit. 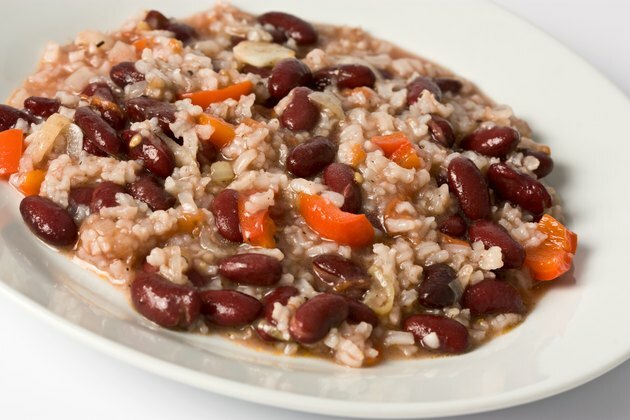 Because beans are high in fiber, they tend to be low in energy density, making them a good protein source if you're looking to replace higher-energy-density foods like meat. Other low-energy-density foods include salads, broth-based soups and fruit. Desserts, fried foods, full-fat dairy products and many processed foods that are high in fat or sugar are among the foods higher in energy density. Each pound of weight loss requires a 3,500 calorie deficit, so if you aren't a big meat eater, you won't lose weight very quickly simply by giving up meat. Cutting 500 calories per day from your daily total will help you lose up to a pound a week, and increasing your daily exercise to 30 to 60 minutes per day can further increase your calorie deficit and speed up your weight loss. Delaware Sea Grant College Program: Seafood Is Good For You!